TOM WAITS-THE HEART OF SATURDAY NIGHT-VINYL. As 1973 drew to a close, Tom Waits had just turned twenty-four and was taking stock of what had been the most important year of his career so far. He had released his debut album Closing Time in March 1973, and then embarked upon a three-month tour between April and June in the hope that album sales would improve. While this was a huge disappointment for Tom Waits, Closing Time sold well in the UK, and in 2012 was eventually certified gold after selling over 100,000 copies. However, in June 1973 although it was a dejected and disappointed Tom Waits returned from touring Closing Time, he was keen to start work on his sophomore album The Heart Of Saturday Night which was recently reissued by the Anti label. After three months on the road with his small band, there was no rest for Tom Waits, who started writing new songs for The Heart Of Saturday Night in June 1972. Unlike many songwriters, Tom Waits didn’t struggle writing his sophomore album which is often known as the “difficult second album.” However, songs seem to come easy to Tom Waits, who was writing an album of songs that were perfect for late night listening. Meanwhile, Tom Waits career received a welcome boost when he featured on the front cover of the free music magazine Music World. This was welcome publicity for the LA based troubadour as he continued to hone songs that were sentimental, sometimes full of self-pity and often tinged with humour. One of the songs Tom Waits penned, and which would later open the album was the title-track The Heart Of Saturday Night was inspired by Jack Kerouac. As the album started to take shape, Tom Waits decided to road test the songs. Rather than play them live at one of the many venues in Los Angeles, Tom Waits decided to showcase some of his new material at the Venice Poetry Workshop, in LA. This would allow him to see if the songs needed work, or he was ready to record. After his successful appearance at the Venice Poetry Workshop, Tom Waits was keen to enter the studio and record the eleven tracks he had written for The Heart Of Saturday Night. He had road-tested them in front of a live audience and now he wanted to enter the studio in late 1973. However, his manager Herb Cohen had a proposition for Tom Waits. Frank Zappa’s The Mothers of Invention had embarked upon an American tour in early November 1973, were now looking for someone to open for him on a tour that would finish in December 1973. This begged the question what happened to the original opening act? Kathy Dalton who had started the tour as opening act pulled out of the tour due to the hostility of Frank Zappa’s The Mothers Of Invention’s fans, who jeered her and pelted her with fruit. Although opening for Frank Zappa’s The Mothers Of Invention seemed like a poisoned chalice, somehow Herb Cohen managed to convince Tom Waits to join the tour in Ontario. It was a decision that Tom Waits would live to regret. Unlike the three-month tour to promote Closing Time, it was just Tom Waits on piano, acoustic guitar and vocals and double bassist Bob Webb. Having joined the tour in Ontario, Canada, Tom Waits received the same treatment from a hostile audience. They jeered Tom Waits and he was also pelted with fruit. To make matters worse, Tom Waits found Frank Zappa an intimidating presence, although he got on well with the members of The Mothers of Invention. Despite that, the tour with Frank Zappa’s The Mothers Of Invention was one that Tom Waits regretted accepting and was glad when it was over. When Ton Waits returned home from the tour with Frank Zappa’s The Mothers Of Invention, he decided to move from Sliver Lake to Echo Park, and would spend much of his time in downtown LA. For someone who observed and commentated on the dark underbelly of American life, this was the perfect location for Tom Waits and somewhere that would provide inspiration for new material. Despite wanting to record his sophomore album The Heart Of Saturday Night, Tom Waits spend the first three months touring the West Coast of America, playing songs from Closing Time and honing the material on Heart Of Saturday Night. After three months playing live, Tom Waits returned home to LA and would prepare to record his sophomore album The Heart Of Saturday Night in April 1974. Despite there being many well-equipped studios in LA, Tom Waits journeyed to San Francisco where he would record The Heart Of Saturday Night in Studio C at Wally Heider Studios. Tom Waits was in good company with Gram Parsons, Grace Slick, Hot Tuna, Jefferson Airplane, The Doobie Brothers and Tim Buckley all recording albums at Wally Heider Studios during 1974. Joining Tom Waits at Studio C at Wally Heider Studios was producer Bones Howe, who replaced Jerry Yester who produced Closing Time. Neither Tom Waits nor Bones Howe knew that this was the start of a partnership that lasted five albums and resulted in some of the best music of the LA-based troubadour’s career. Accompanying Tom Waits who played piano, guitar and added vocals on The Heart Of Saturday Night was a small band that featured some seasoned session musicians. This included a rhythm section that featured drummer Jim Gordon and double bassist Jim Hughart, who were augmented by clarinettist Tom Scott and tenor saxophonist Pete Christlieb. Bob Alcivar was responsible for the arrangements on The Heart Of Saturday Night which was recorded by Geoff Howe. The sessions began in April 1974 and continued until May 1974. After just two months, Tom Waits’ sophomore album The Heart Of Saturday Night was completed. When Tom Waits delivered The Heart Of Saturday Night to Asylum Records, A&R executives discovered an album that had similarities to Closing Time, but was also a quite different album. Just like Closing Time, The Heart Of Saturday Night featured jazz, blues and folk. However, there was a much more prominent jazz-tinged sound on The Heart Of Saturday Night as Tom Waits delivers an album of love songs set in nocturnal world of dive bars and neon signs. This isn’t a romantic world, and the songs on The Heart Of Saturday Night veer between sentimental, to sometimes full of self-pity and are often tinged with humour as Tom Waits reinvents himself. Whereas Tom Waits sung the lyrics on Closing Time, he recites the lyrics on The Heart Of Saturday Night like an early seventies beat poet against arrangements that are built around drums and standup bass. However, throughout much of The Heart Of Saturday Night, Tom Waits piano provides the perfect accompaniment to his lived-in, bourbon soaked vocal that sounds as if it’s lived a thousand lives, and survived to tell the tale on this album of blues, folk and jazz. Jazz-tinged describes the album opener New Coat Of Paint, where Tom Waits’ piano and worldweary vocal takes centre-stage as he sets the bar high for the rest of The Heart Of Saturday Night. On the sentimental sounding San Diego Serenade San Diego Serenade and melancholy, late-night jazzy sound of Semi Suite, Tom Waits’ piano and vocal play leading roles, before giving way to the cinematic Shiver Me Timbers. Strings provide a backdrop to lyrics that are rich in imagery as Tom Waits paints pictures. It’s a similar case on Diamonds On My Windshield where Tom Waits recites the lyrics against a brisk but spartan backdrop of standup bass and drums. Closing side one was (Looking For) The Heart of Saturday Night where Tom Waits delivers a rueful, worldweary vocal as he sings of the dark underbelly of life in downtown LA, and sings of pool halls, dive bars and neon signs against an understated and sometimes atmospheric arrangement. Side two opens with the cinematic Fumblin’ With The Blues where Tom Waits continues to explore the dark underbelly of city life, before he delivers the first of three jazz ballads. The first is Please Call Me, where Tom Waits delivers a needy, hopeful vocal against an orchestrated arrangement. It gives way to late-night sound of Depot, Depot and Drunk On The Moon which feature lived-in vocals from Tom Waits whose perfectly suited to singing jazz. Closing the album is The Ghosts Of Saturday Night (After Hours At Napoleone’s Pizza House) where Tom Waits recites the cinematic lyrics and plays the piano, while painting pictures of life in the restaurant he once worked at. The Heart of Saturday Night built on Closing Time, and once again showcased a talented and versatile singer, songwriter and storyteller who had the potential to become one of the biggest names of the seventies. 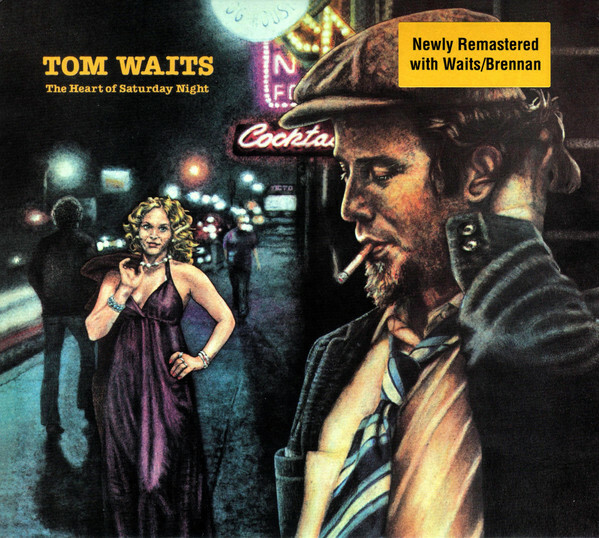 Tom Waits had embraced jazz on The Heart of Saturday Night, but there were still elements of blues and folk on the album, which was scheduled for release on October the ’15th 1974 by executives at Asylum Records. They had high hopes for Tom Waits’ sophomore album, and spent the next weeks and months promoting The Heart of Saturday Night. When copies of The Heart of Saturday Night were sent out to critics, it featured an album cover by Lyn Lascaro. Her illustration featured a tired looking Tom Waits leaving cocktail lounge late at night, as a blonde prostitute watches him. The album cover was in keeping with Tom Waits’ observations on the dark underbelly of city life late at night in 1974. Critical opinion of The Heart of Saturday Night was divided before its release in the autumn of 1974. Some critics were critical of the lyrics believing they were “vague” while some of Tom Waits’ jokes were described as “ill-advised.” Even the mood of the album was criticised as being “too limited.” What some critics seemed to overlook was that The Heart of Saturday Night was an album that had to be listened to late at night when the melancholy, mournful music that was sentimental and sometimes full of self-pity could be appreciated. It was only much later, in retrospective reviews that critics changed their mind about The Heart of Saturday Night and realised that the album was one of Tom Waits’ finest albums. Even Rolling Stone magazine changed their mind about The Heart of Saturday Night and it’s now a regular feature in their list of the 500 greatest albums of all time. Upon the release of The Heart Of Saturday Night on October the ’15th 1974, the album stalled at 201 in the US Billboard 200. Tom Waits sophomore album came so close to charting in America. Meanwhile, in the UK where Tom Waits had a cult following, The Heart Of Saturday Night sold well and eventually sold in excess of 100,000 copies and was certified gold. However, in America Tom Waits’ music was still to be discovered by a wider audience. Just like his debut album Closing Time, The Heart Of Saturday Night with its late-night jazz-tinged sound is a hugely underrated album and one of the finest albums of Tom Waits’ career. Looking back, it’s hard to believe that he was just twenty-four when he recorded The Heart Of Saturday Night, which sounds as if it was written and recorded by an older, worldweary singer, songwriter and storyteller. Tom Waits had an old head on old shoulders. He was also perfectly suited to singing jazz, and is at his best on the jazzy tracks on The Heart Of Saturday Night. Especially the ballads which bring out the best in Tom Waits’ worldweary, lived-in vocal. However, there’s also blues and folk on the album, which was the first that was produced by Bones Howe. Bones How was by Tom Waits’ side right up until the Heartattack and Vine which was released in 1980. During that six-year period, Tom Waits was in a rich vein of form, releasing albums of the quality of 1976s Small Change, 1977s Foreign Affairs, 1978s and 1980s Heartattack and Vine. However, the album that started what was one of the most fruitful periods of Tom Waits’ five decade career. The Heart Of Saturday Night also marked the start of a new chapter in the career of the LA-based troubadour Tom Waits as he embraced jazz on an album of late night music that is perfect to listen to after Closing Time. ← BOB DYLAN-THE BOOTLEG SERIES VOLUME 14:MORE BLOOD, MORE TRACKS. Man I love pretty much everything Tom has done (I do struggle with The Black Rider and One From The Heart if I’m honest) but this album is a huge personal favourite. It’s quite clear in hindsight that the Zappa crowd wouldn’t go for this Billy Joel meets Barfly schtick though.